In an effort to document my family treasures which cannot be scanned in, I am publishing this series of pictures as part of the Treasure Chest Thursday theme at Geneabloggers. Someday in the future, I hope to shed some light on these treasures for my family who might inherit them. What were they for? Who did they come from? Why were they considered treasures? Let’s find out. 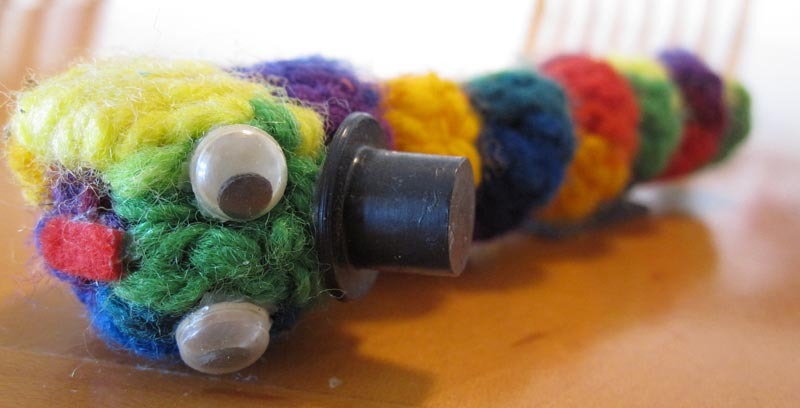 Meet Mr. Rainbow Caterpillar. Mom made him out of rainbow yarn, a pair of googly eyes and a top hat for a nose. He has magnets glued on his back so he sticks to the refrigerator. I previously talked about my mother’s craft projects, such as the Jessica Cross-Stitch Magnet and the Golf Ball Dog, which she sold at the school art fairs. This is another one of those little projects. I keep him stored safely away because my cats like to chew on him. http://www.jessicagreen.com/wordpress/2012/01/12/treasure-chest-thursday-rainbow-caterpillar-magnet/You must be logged in to post a comment.